I'm not very big into Halloween crafting (though I do love anything pumpkin related!) but I guess it's because I'm drawn to birds that I just had to have the new set of Tim Holtz raven thinlets dies! 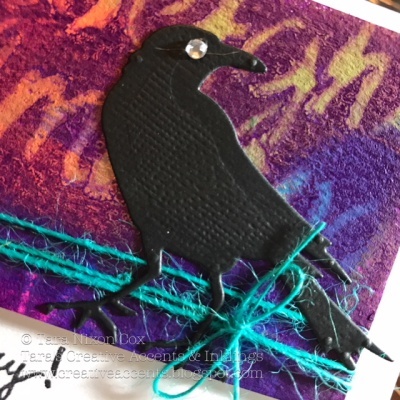 I've had several ideas running around my head to do with them... but a last minute need for a birthday card gave me a good opportunity to put together a quick card and the raven was a great seasonal focal point! I die cut the set of dies from black card stock that I had put adhesive on the back of so they would be ready to go... and started looking around my messy desk for inspiration that was ready to go! I had a small piece of watercolor paper sitting there, covered with a rainbow of colors since I'd been using it to wipe off my paintbrush after watching Dina Wakley paints in my journal :) It was pretty chaotic looking, but I decided it could make a fun background so I painted over the entire thing with Dina's blackberry paint. While it was still wet, I set a stencil (by Dyan Reaveley) over it and wiped through the stencil with a baby wipe. The chaos showed through and the results are actually pretty fabulous! I think I'll be repeating this wild mix of colors again soon! Since I was in a hurry, I used my heat tool to speed the drying process. 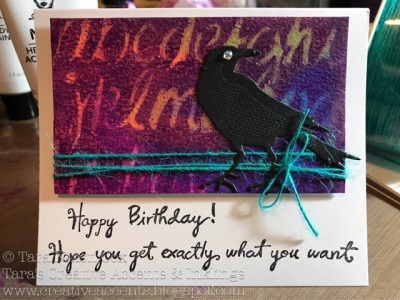 While it set, I found a blank card and a birthday sentiment, which I stamped in black. I then trimmed down the card around the sentiment to make it closer to the margin I wanted around the colored panel. I selected some teal twine to add texture and wrapped it around the panel before adhering it with foam tape to my card. The raven settled in nicely on the right side of the panel, and a small rhinestone eye finished everything off. 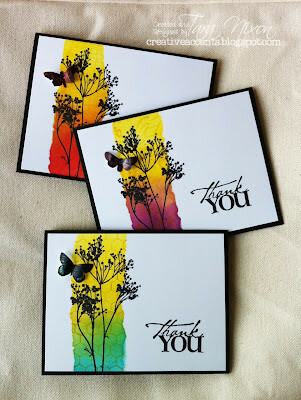 It's a very simple card, but the vibrant colors and bold design really work for me! I added another of the die cuts to the inside of my card to tie everything together. It was a fast and fun project, and it's got me wanting to continue creative play... hope you like it!